These are the remnants of a lost civilization which sank into the sea so long ago that nobody remembers whether Heide was the name of the kingdom or was simply what the continent was called in those days. The Way of Blue was founded in ancient Heide and is still headquartered in the Cathedral of Blue. It is possible that the nearby Cathedral was built for worshiping Flame God Flann, which also explains why this area is called the Tower of Flame. The Tower of Flame looms over the sea in stark defiance of the natural forces which leveled the rest of Heide. Firelight from its gallery dances and flickers in the sky. 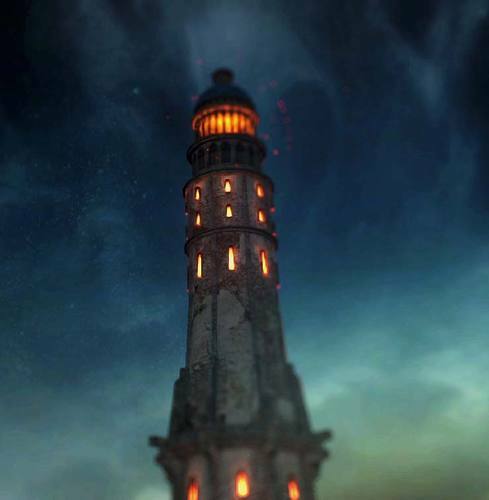 Though its original purpose has been lost to the flow of time, the Tower now serves both as a lighthouse warning passing ships away from danger and a beacon guiding those who seek the Blue Sentinels. Old Knight: These giant warriors are relics of an era that has long passed. Whether they attack you out of madness or merely as a trial for would-be Knights of the Blue will matter little if they manage to cut you down, though, so stay alert. If you do intend to enlist as a Knight of the Blue, you'll require the power of the Cracked Blue Eye Orbs they hold, so consider this your rite of initiation. Dragonrider: The Dragonriders are renowned as faithful servants of King Vendrick. Dragonriders rode onto the field of battle mounted on wyrms, but this was a hard-earned privilege. The training of the Dragonriders was arduous and fraught with peril. Only the best of the best oculd complete the training and join this elite unit of Vendrick's troops. Those who failed in this training were torn apart by the very wyrms they sought to command. The founders of Heide were inspired by Anor Londo. 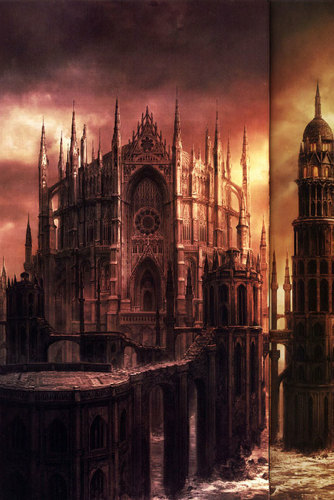 Heide's Tower of Flame and the Cathedral of Blue have similar architecture to Anor Londo, but there are differences. It can be inferred that the Heide area was founded by people with limited knowledge on Anor Londo and the Gods. 2. The Cathedral of Blue is guarded by a man nearly identical to Dragonslayer Ornstein, who guarded a cathedral in Anor Londo. It is possible that the people of Heide had heard tales of a dragonslayer in lion armour guarding a cathedral, so it became tradition to have a knight wear lion armour, wield a spear and guard their cathedral. 3. The Blue Sentinels serve a similar purpose to the Blades of the Darkmoon, but while the latter Covenant were dedicated to protecting the deities of Anor Londo, the Blues simply punish sinners. This implies that the people of Heide had heard legends of the Darkmoons but only knew of their roles as arbiters. 4. The Old Knights look similar to the Giant Sentinels. As such, it can be inferred that Heide was the result of people attempting to create a new Anor Londo, but with only limited knowledge of the original, leading to the bizarre inclusion of the Old Dragonslayer and unusual Gwyn-eque statues. "I expected this cathedral to be bustling, but there's hardly a soul to be found here. Without any goings-on, I'll have to move soon. To a place I could gull the… Sorry, help the gullible by teaching the good word…Hah hah…"
"Do you ever cry out for help? The journey of an Undead is long and treacherous. You'll face invaders from other worlds at every turn. If you need help… Why not proclaim faith in the Blue Sentinels? When you face danger, the Blue Sentinels will come to your aid. Protection is yours, if you wish. You need only accept their kind embrace." Yes - "That is a wise decision. People are weak…But the Blue Sentinels watch over us in their benevolence. Let the Sentinels cradle you in their embrace." "Heide's Tower of Flame lies beyond the far gate. In the cathedral, the apostles of blue gather. But the road leading there is perilous. The gate is rigged with some contraption… But how it works, I just don't know…"
"A group calling themselves the Blue Sentinels have gained much power in Volgen. You can't even run a shop without their blessing. They claim to be working for the greater good, oh…but it's absolute hogwash." "Have you heard of the Blue Sentinels? They're a thorn in our sides, to say the least. Their men are obsessed with hunting down blood servants. Ah, who cares? It's just another chance to spill more blood. Doesn't that excite you, hm? Heh heh…"
Soul of the Old Dragonslayer The Old Dragonslayer is reminiscent of a certain knight that appears in old legends. Use the special soul of the Old Dragonslayer to acquire numerous souls, or to create something of great worth. A ranseur forged from the soul of the Old Dragonslayer. The spear of the knight known as the Dragonslayer was imbued with the power of lightning, and shattered the stone scales of dragons. Strong attack unleashes its latent power. The beloved ring of a dragon-slaying knight. Strengthens thrust weapon counter attacks. After many years of use, the ring's face has worn down, but close inspection reveals an engraved lion. Soul of a Dragonrider, who faithfully served King Vendrick. Long ago, the dragonriders mounted wyrms, and were feared on the battlefield for their unparalleled strength. Use a Dragonrider soul to acquire numerous souls, or to create something of great worth. Whether Heide was a proper kingdom or not isn't clear, as it fell into the sea long ago. What is known is that the Way of Blue originated in Heide. Equipment from Heide still exists today, as well, which speaks to the durability of the special alloy used in its construction. If this knight truly is from the ancient land of Heide, is it possible that time distortion explains his presence? These giant warriors are relics of an era that has long passed. Whether they attack you out of madness or merely as a trial for would-be Knights of the Blue will matter little if they manage to cut you down, though, so stay alert. If you do intend to enlist as a Knight of the Blue, you'll require the power of the Cracked Blue Eye Orbs they hold, so consider this your rite of initiation. Online Play item. Invade the world of the guilty. Can only be used by members of the Blue Sentinels covenant. Punish the guilty to strengthen the bond with your covenant. Token recognizing that the owner has traveled worlds to help others. When in other worlds, it can be also used to restore the master of the world's HP, but this is only a secondary effect of the item. Simply carrying these tokens shows the depth of the holder's fidelity. Ring of the Way of Blue covenant. Increases HP slightly. The Way of Blue is not a developed religion. It is a humble prayer that spread naturally amongst those seeking help. When apostles of Blue are invaded by dark spirits, they can receive assistance from masters of other worlds. Ring of the Blue Sentinel covenant. Join this covenant and wear this ring to be automatically summoned to the worlds of blue apostles who have been invaded by dark spirits. The ring is engraved with the crest of the Way of Blue, symbolizing the dignified oath to protect each world's master from dark spirits. Straight sword originating in Heide. A special alloy makes it very durable. The composition of the alloy of these swords remains a mystery, but in Drangleic the attempt to imitate it resulted in the similar bradden steel. Chainmail worm by Heide Knights. Whether Heide refers to a kingdom or was just a name for the land is not clear, for no records date back far enough to tell. All that is know is that the Way of Blue has its origins in Heide, and that Heide was later subsumed by the sea. A blue shield with a gold relief of wings. Likely a symbol of guardianship used by Knights of the Blue.. Contains materials enchanted by magic, allowing spells to be deflected by parrying.